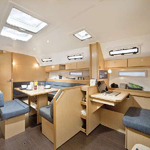 Boat Bavaria 40 Cruiser named Aida was produced in 2012. 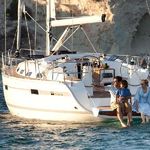 We offer this yacht from harbor Sukosan in the area of Zadar. Aida is licensed for 8 passengers. 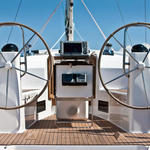 Layout of the sailing boat is 8. 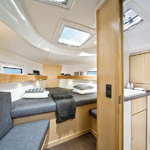 Bavaria 40 Cruiser Aida has 3 bedrooms. For guests disposal there are 2 WC with showers. You can fill the diesel tank with 210.00 l liters and in water tank it goes even 360.00 l liters. 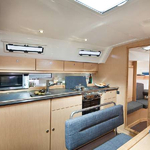 With engine 41 kW Volvo Aida can navigate really fast. 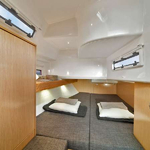 Aida is 12.45 meters long and 3.99 m wide. Draft is 2.05 meters. 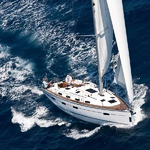 Read about other boats in this section: Yacht charter Sukosan. 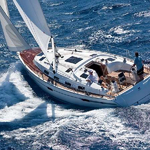 Sailboat's equipment involves : Radio / cd player, Bed linen, Furling mainsail, Bimini top, Dinghy, Anchor electric windlass, Autopilot, Gps plotter, Bow thruster. . Nonrefundable deposit has value 1500.00 EUR. 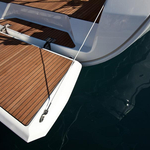 Choose our offer and enjoy your vacation on the deck of Aida. 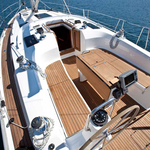 This Bavaria 40 Cruiser from Sukosan from Croatia Search for by going here: Yacht charter Croatia.